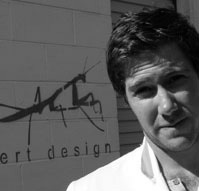 Andrew Simpson is an accomplished Industrial Designer and the driving creative force behind Vert Design. He achieved an honours degree from the University of Technology Sydney, as well as a sub-major in Object Design. While working as a glass blower, he experienced limiting pressure to be defined by an aesthetic and conceptual body of work which compelled him to establish his own firm. “My philosophy was, and is, that the work should come first with the techniques being secondary to the end result, not the other way around.” Andrew’s object designs have a shared focus on aesthetics, function and seamless user interaction. Throughout his work are themes of abstracted forms and ambiguous references to nature, which enhance the pleasure derived from the finished product. Today Andrew and his colleagues enjoy the freedom to pursue a diverse and stimulating range of projects. The team designs medical equipment, furniture, plus sporting, electrical and consumer goods for leading Australian and International manufacturers. Vert Design combines the expertise of a commercial design practice with the fun and innovation of a small production house. They also generate commissioned glass works for galleries, collectors and commercial spaces around the globe. The products on offer to the public are a reflection of their unique business portfolio of design collaborations, consulting projects, manufacturing solutions and original ideas. Vert Design takes an environmentally friendly (aka green) approach to their design processes and seeks to attain sustainability by making products aimed to last over time through physical durability, function and uniqueness. Design processes such as using existing parts or components instead of creating new ones are adopted and recyclable materials are favored. They are proponents of plantation grown pine as renewable material, plywood to maximize lumber as a resource via the reduction of manufacturing waste, and they avoid formaldehyde due to its potential detrimental impact on the environment. Adam Goodrum: Adam Goodrum is one of the new faces of Australian design, producing a broad spectrum of work including glass objects, mass produced handheld objects and high-end furniture. He holds a degree in Industrial Design from the University of Technology Sydney, and has spent part of his career working abroad in London. Adam has received several accolades including the Sydney Morning Herald Young Designer of the Year Award in 1997 and the Bombay Sapphire Design Discovery Award in 2004. The latter is viewed as one the most esteemed design awards in Australia and won him the opportunity to exhibit at the prestigious Milan Furniture Fair in 2005.